OLD BRIDGE, NJ --(Marketwired - April 04, 2016) - Renaissance Properties announced today the grand opening of The Gables, Monroe Township's newest and most unique age-restricted community. Set for Saturday, April 9, the grand opening will introduce a new product and concept to the active adult market. The Gables is comprised of 71 generously-sized, masterfully-designed townhomes. Each includes a first floor master suite, 2 additional bedrooms and loft on the second floor, a sizable basement and garage. Further distinguishing The Gables is the appeal of the new adjacent Gables Plaza which offers shops and services within walking distance of the new townhomes -- a rare convenience in the desirable Monroe Township suburban location. "We designed The Gables with today's empty nest homebuyers in mind," said Bob McDaid, President of Renaissance Properties. "But unlike other communities built for this market, the amenities we've included very clearly set it apart -- including basements that allow for recreation and discreet storage, ample square footage, and the convenience of walkable shops and services." In addition, a private, right-sized Lifestyle Center will be located at Gables Plaza for residents to work out in or just hanging out with neighbors. McDaid added, "This unique combination of attributes in desirable Monroe Township, New Jersey, makes The Gables the most compelling value in the area and the optimal choice versus the traditional mega-communities." Home sizes at The Gables range from 2,316 to 2,738 square feet and start in the mid $300,000s. The Grand Opening on Saturday, April 9 runs from 10 a.m. to 5 p.m. Guests can talk to sales consultants, see model floor plans, select from available lots and take advantage of pre-construction pricing. The address is 2A Gables Way, accessible via Applegarth Road to Federal Road to the Gables Sales Office on the right. For more information and directions, call 609-443-0995. Renaissance Properties was founded 25 years ago and has grown from a small real estate brokerage company to a multi-faceted real estate development firm and home builder with more than 1000 new homes and nearly 800,000 square feet of commercial space to its credit. With distinctive and accommodating floor plans, thoughtful structural options and several appealing architectural elevations to choose from, new home buyers appreciate the level of customization and personal touches that Renaissance Properties offers to transform exceptional new "houses" to personalized new "homes." Renaissance Properties also takes pride in its reputation for constructing desirable and impeccably managed and maintained commercial properties throughout central New Jersey. Renaissance Properties specializes in creating engaging facades and thoughtful site layouts that are aesthetically pleasing and effortlessly functional for both tenants and patrons. The company offers locations in perennially strong areas and works with tenant rosters ranging from large national retail chains to small local businesses. For more information about Renaissance, contact Robert Adinolfi at 732-970-9400, ext. 105 or raadinolfi@renaprop.com. 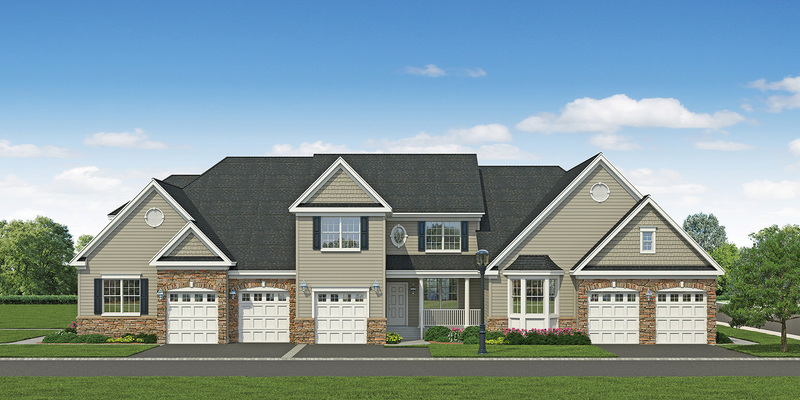 The Gables offers just 71 masterfully-designed townhomes in desirable Monroe Township, NJ. Each comes with the master suite on the first floor, guest bedrooms upstairs, spacious basement and garage. The biggest plus is that The Gables townhouse are just a convenient walk to shops and services at Gables Plaza.